There’s a certain system to snagging the top-selling Zara pieces before everyone else or even worse before they sell out. We've all been there, frantically checking our inbox to see if we've received an email alert informing us a particular item is back in stock. No fun, right? The good news is there are ways to avoid this stylishly stressful situation. From avoiding the crowded store to knowing where to look for inspiration, we’re sharing seven ways to always score the best pieces at everyone’s favorite fast-fashion store. Live by these tips, and you’re sure to always score the best Zara finds. 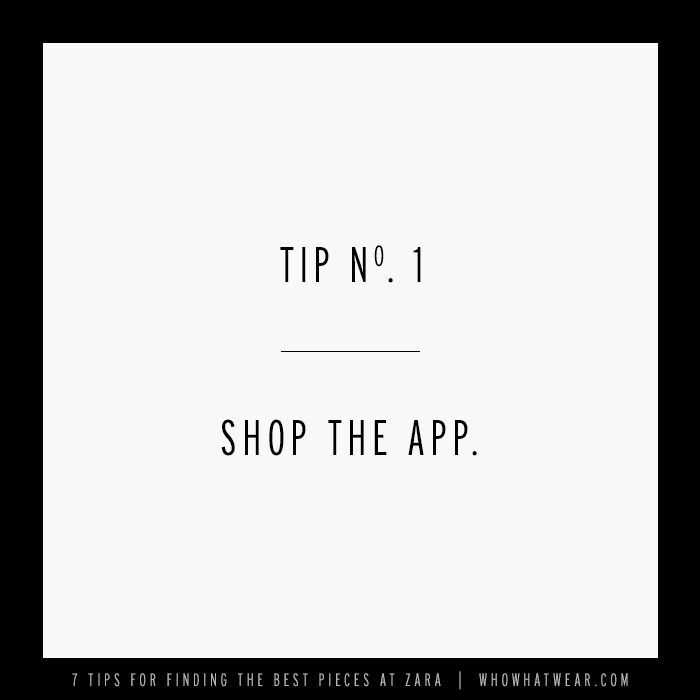 Download at your own risk because Zara’s user-friendly app makes shopping super easy and dangerously convenient. The brilliant app mirrors the brand’s homepage with a new-arrivals section, seasonal picks, trends, and lookbook inspiration. It also saves your account information, allowing you to quickly pick your favorite pieces and check out with a breeze. Really, our co-founder Katherine Power swears by the app. We called around for this insider information and learned new products hit online stores every Tuesday and Thursday. So if you’re hoping to snag the coolest pieces before they sell out, shop on the right days. Allot yourself a good 45 minutes to really browse online through Zara’s seasonal sales. It’s a bit overwhelming at first, but take your time, and click around to find the items you’ve been eyeing all season. Here’s a tip: There are multiple rounds of markdowns, so make sure to check back every couple of days. It’s worth it—we promise! This one is pretty straightforward, but avoid the long lines and hectic dressing rooms at the mall by shopping online. You’re way more likely to find what you want online rather than searching through the racks. Plus, the outfit and styling inspiration is always on point. Looking for a simple white T-shirt or loose button-down shirt? Don’t forget to shop the brand’s basics section. It’s stocked with an assortment of quality T-shirts perfect for updating your selection of casual clothing. Snag our favorite Zara pieces below! This textured off-the-shoulder sweater will elevate any casual look. Wear these statement jeans to your next summer concert. If there's one new shoe trend you try this upcoming season, make it the naked shoe. Add this ruffled top to your summer wardrobe stat. This bag looks way more expensive than $40. ICYMI: Anything pink goes for summer. Take note of the on-point styling here. Up next, read about the Obsessive Zara Disorder.